Ahead of the channel's launch on Tuesday 20th September 2016, Blaze has been added to Freeview channel 83 and a +1 channel on 84, also visible on YouView and EE TV receivers. The channel will also be available on Sky, but a channel number hasn't yet been announced. It will broadcast in standard definition. Blaze will be the first free-to-air channel for A+E Networks here in the UK and will unite the company’s biggest franchises, such as Pawn Stars, Mountain Men and American Restoration under a single brand. It is not immediately clear if there are any plans for scripted content. While at present the channel will only be launching in the UK, the ambition is for A+E to roll out Blaze across their international footprint, making it the first global free-to-air brand. “I’m really excited about the launch of Blaze. It’s great that we can offer free-to-air audiences the chance to enjoy many of A+E’s hit shows, with much of the content new to Freeview”, said Heather Jones, A+E Networks General Manager, UK. 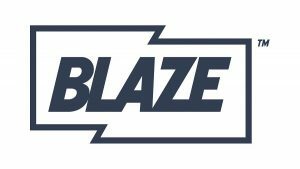 “Blaze’s name and identity were created to celebrate the spirit of the extraordinary characters featured on the channel. We are thrilled that Blaze will also include a digital launch as a full TVE service, so viewers can watch and catch up with their favourite shows wherever they are and whenever they want”. The logo looks like it's an American car shampoo brand. Programming wise, largely what we expected I think. Where Blaze really is attempting to tap into is the male market, as the majority of recent Freeview channel launches from pay TV channel operators have aimed for a female audience (TruTV, YourTV). And I feel that the programmes brought from History seem to suit Blaze well, even more so than History itself, because of the distorted remit that History relies itself upon. Blaze, as well as its timeshift, has been put on an almost completely full COM4 mux, so whether it gains a stream off another channel, or that it will use space from an extra stream created on the multiplex, it's completely unclear on what will happen. Off topic - with Hochanda moving to LCN 85, I wonder where that leaves the Store. It's a waste of valuable Freeview spectrum that the ITV digital channels subsidiary could use instead to extend the hours of CITV, and the timeshifts of ITV3 and ITV4. The Store really doesn't have much use now, it's almost as useless as the Big Deal was back in the day. Not, as the all-too-familiar phrase has it, available in the Channel Islands, of course. Is A&E itself going to launch in the UK any time soon? Seems to me like the logo looks like Spike's logo, but as we can see on this promo, the logo is actually a flag without a pole. Might be nice to have some new HD channels rather than loads of new SD ones, but I guess the market dictates! Sure it'll be good. Agree - a516digital reporting this is now the 16th channel on the commercial muxes and I really think with the future in mind OFCOM should be blocking Freeview from adding DVB-T channels and have them begin working towards switching to DVB-T2. Another Freeview channel that I'll never watch. Yep it looks like another channel similar to the likes of truTV and YourTV, output wise. I've never watched YourTV, and I only ever really watched truTV when Conan (US late night talk show) was shown on the channel.